Big Sky Basketball: What Will Brandon Cataldo Provide For Portland State? What Will Brandon Cataldo Provide For Portland State? I think there's a chance Portland State could make the leap up to third in the Big Sky Conference this season, but they are going to need some guys to step up. They should know what they are going to get from Charles Odum and Chehales Tapscott. We have looked at Michael Harthun and what he could bring to the table this year. The other key piece could be Brandon Cataldo. Cataldo is a 6'10'' redshirt freshman out of Rainier, OR. He got injured his senior year of high school (with a broken leg) and spent last year working on his game and getting back into shape, according to the school website. He has the potential to be a great Big Sky player. 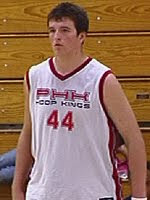 Going into his senior year, he was the 10th ranked high school center in the country, and the 2nd highest ranked center on the west coast (though his rankings dropped a little bit because of the injury, pre-injury he was behind some guy named Josh Smith, who might be the best player in the Pac-12 this year). As a junior he was the conference player of the year in his high school conference. He was a bit of a late riser as a high schooler, but if he can get back to his former shape and explosiveness, he will be one of the top bigs in the Conference. He has excellent hands and moves well for a big man (he has had some weight issues in the past). He is a solid passer as well. Unlike some guys that like to play on the perimeter, he is a true post player that is not afraid to get dirty. Cataldo will be one of the more interesting stories in the Big Sky this year. If he is back 100% (or close to it), a front-line that involves Tapscott and Cataldo could easily be the best in the Big Sky. Brandon does not like to draw attention to himself. He is actually 7 foot now with shoes, they don't play barefoot. Water seeks it's own level. Winners win and when faced with a challenge , they win anyways. Been waiting for over two years to watch the games that are a month away (pre-season).